Backup systems are one of the most important things for your Business When something goes wrong, you have the ability to reset things to before the issue and get up and running quickly. One of the biggest issues with backup systems is the mistakes that can happen that mess up the process or the actual data. When your backup gets compromised, you have very little recourse to retrieve any lost data. Here are some of the most common mistakes that happen with backup systems. By understanding the things that could happen, you have a chance of avoiding them when backing up your systems. It happens all of the time, businesses set automated backups and do not check to ensure that they are working correctly. One thing that everyone in a situation where backups are important should remember is that automated processes sometimes end up failing over time. Making sure everything is working as it should be is of the utmost importance. When most backup software runs it skips over any open programs, which means there may be important info that is left running during a scheduled backup. Whether it is a personal computer or business computers everyone needs to understand that nothing should be running if a backup is scheduled to be run. There are many things that can happen to computers, including theft, fire damage, flood damage and so much more. Keeping your data backed up on one system is just asking for trouble if any of the above disasters were to happen. Just as backups are scheduled locally they should also be backed up to a different location. This is another very common mistake, hard drives and cloud drives that are almost completely full. When this happens a backup cannot be fully performed. It is important to always ensure that there is sufficient storage on whatever devices or locations that you use for your critical backups. 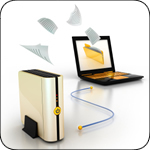 In some cases users may schedule a backup and accidentally set them up to backup the wrong folders, drives, and documents. This is something that it is always important to double check or you are at risk of losing the data that you really want to be protecting. This is another big problem, and is also very common. There are plenty of computer users out there who think that if they perform the proper maintenance on their computers so they run smooth that they will never have to worry about crashes. Thinking like this is just begging for trouble, and this is something that people need to be more aware of because no matter how expensive or reliable your computer is, there can always be problems. No matter what the circumstances it is important to always remember to backup your important data on a regular basis.